The perfect spacious accommodation affording over 850 square feet for family/ friends/business. Two totally private accommodations, one featuring a king bed with fireplace, wet bar/refrigerator, in room coffee/tea service, and a fullsized closet with plush terry robes for your use while staying with us. This room offers a tub/shower combination. A private patio/balcony completes this part of the suite. The second private accommodation features two queen beds, a fullsized closet with plush terry robes, an oversized vanity/dressing area and a shower. Enjoy your own television in this room. A separate private patio/balcony completes this ensemble. Breakfast is delivered at your requested time to be enjoyed in bed, or on your private balcony/patio. This accommodation is perfect for families and friends affording each of you total privacy or being together. Enjoy watching the relaxed pace of "The Heart of the Village" from your patio or balcony as your view some of the most magnificent oak trees you will ever see. 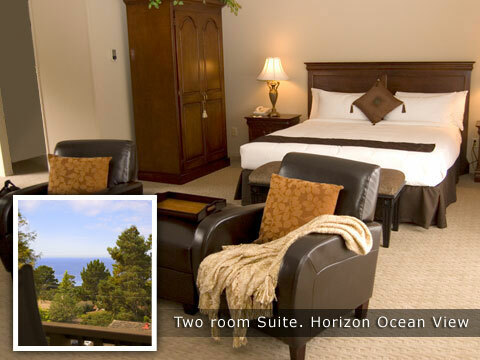 Your private balcony affords you a horizon view of the Pacific Ocean. Enjoy the gentle tranquil sound of the distant surf as you relax and embellish in the moment! This English Country Suite surrounds you with refined floral motif furnishings.Relax in your living room in front of the fire, snuggle on the sofa or enjoy your balcony overlooking the garden/pool area.In room coffee/tea service and a refrigerator add to your comfort. The bedroom portion of this suite also offers a second balcony, writing desk, and an additional sitting area.Two fullsized closets (complete with plush robes and satin hangars), large vanity areas, a tub/shower and a separate shower provide for a combination of desires. A silver trayed continental breakfast is delivered to your room daily at your requested hour as you linger and enjoy the fresh ocean air.The Cottage Suite is a perfect selection for entertaining, small business gatherings or for those desiring a more eloborate accommodation. Both balconies look over the garden area with roses, birds of paradise, lush ferns and a visiting humingbird now and then as well as a view of "The Village".